28 May 2007. Today we woke to some sad news. After a long illness Eduardo Pons Prades, one of the great antifascists of the 20th Century, has left us. He died in the Sant Pau Hospital in Barcelona. An active participant in our contemporary history in his youth, in maturity he would write over 20 books on the Civil War, on World War II, on the Maquis, on the resistance against Franco, and on capitalism as well as publishing numerous articles in history magazines. And, of course he was always ready and willing to open a debate and analyze the root causes of everything that what was happening in Spain. We reproduce here an article which appeared in Solidaridad Obrero 18 months ago. Last June, Professor Bernat Muniesa organized an event in the main hall of the Central University of Barcelona in recognition of the figure Eduardo Pons Prades. It was a tribute to his extensive history as witness to, and participant in, the events of the 20th century which had shaken both Spain and the rest of Europe. Eduardo was quick to make sure we realized that the homage was a homage to all his companions in the fight for individual and collective liberty. Some days later we arranged to meet Eduardo in a small bar in Valencia Street, as we had so many times before, but this time to take note of the conversation. When we arrived he welcomed us with his typical good humour and the conversation quickly became so animated we could hardly keep up. Eduardo was born on the 19th of December 1920 in Wifred Street, between Ponent. (today Joaquin Costa) and Tigre, in the Raval district of Barcelona. The son of Valencian immigrants his was a practically inescapable destiny. Around that time Salvador Segui with other anarcho-sindicalists had been deported to Mahon. Meanwhile in Zaragoza the echoes of the group the “Justiceros” later the “Solidarios” were beginning to be heard. This was working class Barcelona with strangling unemployment and where even the luckiest day workers could barely feed their children. His father had moved to Barcelona from the village of Alboraya in 1916. By professión a cabinetmaker, he was one of the founding members of the Union of Woodworkers at that time situated in San Pablo Street. in the same building as the Diana Cinema and close to the Monumental ( during the dictatorship “The Gardens of Granada” and now in the democracy a sports pavilion). Some years later, in 1925, he was able to open his own workshop at 103 Vilodamat Street. With hard work and effort he managed to keep the business going till the coming of the Republic but at this time his clients, the majority of whom were petty bourgeois, discovered that he was an anarcho-sindicalist and many began to cancel their contracts. Eduardo picks up his father’s story. He began to work in the workshop of Casa Bardina at 196 Aribau Street and continued there for the next two years or so. It was here that his father insisted Eduard should learn a trade. Every summer from then on he accompanied his father with his toolbox and varnishes. However Eduardo’s true vocation was teaching and he dedicated all his efforts to this end studying at the Work School (today the Industrial School) in Urgell St.
His mother, Gloria Prades Núñez, was also Valencian from the village of Almasera. With the Republic she started work as a telephonist in the Generalitat palace thanks to the friendship his father had formed with the Councillor Marti Barrera whilst in the Modelo Prison in 1925. Eduardo raises his fist again energetically. “My father’s advice was always that a book is your best friend, but my uncle always added ‘Yes, but together with a good gun, if not no one will ever take you seriously’.” His father was an anarcho-sindicalist but his uncle, more radical, was closer to the position of members of the FAI. Eduardo remembers that his uncle was one of the pallbearers at Durruti’s funeral as the cortege passed along Via Durruti (Via Layetana) that fateful day in November ‘36. Eduardo, with sadness, explains how his father had taken his own life in March 1936, perhaps because he saw what was coming and decided he really could not face it. Before the Republic Eduardo had started attending the conferences organized in the old Asiatic in Rosal Street and some years later those at the rationalist school “Labor Germinal” at 2 Cera Street where the director was the French man Oliver Bertrand. There he had the opportunity to attend several excellent conferences by the geologist Alberto Carsi who taught the young students Natural History and in particular Geology and Speleology. Eduardo subsequently was to meet the Carsis again. Just before the 19 July 1936 Eduardo obtained his High School Certificate. After the 19 July, like so many other enthusiastic young people, he took an active part in the collectivization of the Union of Woodworkers which was then located at 195 Diputación Street where Joaquina Dorada was working as secretary. They also took over other premises like the church of Santa Madrona in Poble Sec which was used as a warehouse. The Construction Workers Union was given the task of constructing a small building next to the former church for the woodworkers’ union. The church spire was also dismantled to avoid its possible use as a reference point for the fascist aviation who were targeting strategic points like the nearby Power Station in Paral.lel. Eduardo was eager to go to the front but he was too young. He decided to falsify the necessary identity papers and managed to enrol in the war training school. The Popular War School had three training centres: in Pins del Valles (San Cugat del Valles), in Xativa and in Escorial de la Sierra. Eduardo was sent to l’Escorial on 20 August 1937. After 3 months’ training he received the title of Sergeant from the hands of the poet Miguel Hernández who was then Political Commissar of the 46th Division whose Chief of Staff were based in el Escorial. Ready for combat, he was sent to join the 105th Mixed Brigade, part of the 3rd División, in the West Guadarrama Sector between the villages of Valdemorillo and Zarzalejos. It was here in December 1937 that he received his first experience of combat. He was then transferred to the front at Brunete/Quijala where positions had more or less become entrenched and there were only small skirmishes. In March 1938 he was given his first leave and he returned to Barcelona via Valencia and Tarragona. Back in Barcelona he was visiting his colleagues in the Sindicalist party at the headquarters in the Rambla next to the Sepu department store when there was an air raid. Several buildings in Carmen Street were hit and nearby cars were commandeered to evacuate the injured. Eduardo had never driven before in his life but he took one of cars parked outside the door of the party headquarters and began to help with the evacuation taking those who had only slight injuries to the medical centre in Sepúlveda Street. On 17 March 1938 the fascist raids hit a lorry transporting the explosive tolite at the corner of Gran Via and Balmes destroying 7 or 8 buildings and leaving bodies everywhere, Eduardo happened to be at the petrol station nearby in Pelayo Street Ronda Universidad. The car he was in was overturned by the blast and he was propelled 50 metres and lost consciousness. He came round two days later in the Military Hospital which was then still situated in Tallers Street. Apart from extensive bruising he was also diagnosed with organ displacement and remained in hospital for a month. He came out of hospital on the 15 April but was unable to return to the 105th Mixed brigade in the Centre War Zone as this had been cut off from Catalonia so he went to Guisona where he served as instructor to the “Baby Bottle Brigade”. There he met Joan Llarch who was also acting as instructor to the recently enlisted young conscripts. Amongst Llarch’s trainees was Antonio Samaranch who subsequently escaped and joined the cohorts of fascist Spain. The Baby Bottle Brigade they had been instructing entered combat with the 60th Division at the Segre front at Balaguer. The battle which lasted from the 25 April till 3 May was for a hill which controlled the area el Cerro del Merengue in the district of Sant Roma d’Abella. For a time the front lines were stabilized though the fascist troops did manage to take an area known as the Barceloneta on the outskirts of Balaguer. On the 24 and 25 of July 1938 the Ebro offensive began. Eduardo crossed the river by boat on the first day with the third group of men. The battle lasted till the 16 November. He assured us that there were 5 Republican offensives and that what they won from the fascists in a week took 104 days to win back. But then it was the same old story, the outrageous and unjust question of the supply of arms. The Russian and Chec boats reached the port of Bordeaux and the arms were then transported by train to the frontier at Puigcerda but this last part of the journey was a calvary as the French authorities did there best to impede their entry into Spain. And the arms never arrived. If they had the Ebro would have been another story. After the defeat, with the driving licence he had obtained as an ambulance driver, Eduardo presented himself to Joseph Robuste Pares who was General Inspector for Evacuation. Together with other companions he was put in charge of the evacuation of the wounded to hospitals between Barcelona and the frontier with France. Between the 15 December 1938 and 10 February 1938 they managed to evacuate 10,300 injured. Eduardo remembers the last evacuation on the night between 9 and 10 February when he transported 15 International Brigade soldiers who were in an improvised hospital in Garriguella. He left Catalonia through Port Bou in March 1939 a few hours before the fascists reached the frontier pass. Once in France, thanks to his credentials as war wounded, he was lucky enough to be sent to a hospital in Carcassone where he spent 12 days. There, a family form Valencia who had lived in France for some time and who had taken care of his brothers, claimed him and so he went to live with them in Bloumac near Carcassone where he worked as a official swineherd looking after pigs in the countryside. In 1942 he joined the Spanish resistance action groups in Aude. With Manolo Morato and Thomas Martin he was in charge of coordinating the different Spanish guerrilla groups until the last combats for French liberation in August 1944. He also collaborated with evasion groups for both Ponza and Manolo Huet. Manolo Huet had been one of the “Eroles Boys” of Revolutionary Barcelona and was now in France tirelessly dedicated to saving Jews and Allies by sea. In Nazi-occupied France he was able to save his former teacher Alberto Carsi, sought as an anarchist, a mason and a Jew from the clutches of the Gestapo. On 14 October1944 he made his first clandestine entry back into Spain to see how his companions of the Sindicalist Party were faring visiting Euskadi, Oviedo, Madrid and Barcelona. He stayed until the 11 November. His second visit to Spain was less fortunate and on the 5 January 1946 he was arrested as he was preparing to return to France with a guide from Quico Sabater’s group. The guide managed to escape near Puigcerda but Eduardo was conducted to Pont de Molins to the Army Military Information Service. On his leg Eduardo was carrying some notes hidden between the pages of the newspaper El Español. During the journey he asked for permission to relieve himself on the mountain so he could get rid of the incriminating documents. But another pair of civil Guards who was following behind found them and when he arrived in Pont de Molins he was confronted with the papers on the police officer’s desk. From there he was sent to Salt where the teacher at the prison was Joseph Pallach. Together they worked out a plan so that Eduardo could be transferred to Barcelona during the holiday period. He arrived on the 25 January just a day before the celebrations for the anniversary of the “Liberation of Barcelona”. He managed to escape thanks to a bribe Alberto Carsi’s brother paid to a police inspector at via Layetana central police station. The inspector had not seen the reports about Eduard’s record as a dangerous criminal. The bribe was supposedly bail till all the police records arrived. Eduardo left immediately for Valencia where he had relatives who took him in. He managed to hide there until he could escape to France where he stayed until 1962. He then returned to Spain, specifically to Extremadura where his female companion lived. Then it was a question of trying to make a living and survive as did so many other Spanish people. In spite of everything he did not wait till the death of the dictator to express his dissent, here and there he began to write and publish the occasional book. With the advent of “democracy” he doubled his efforts in an attempt to leave a true account of the recent history and memory of a people. And so he continued for the rest of his life, faithful witness to the fact that freedom had been possible but that somehow this daring to seize liberty had a terrible price to pay. 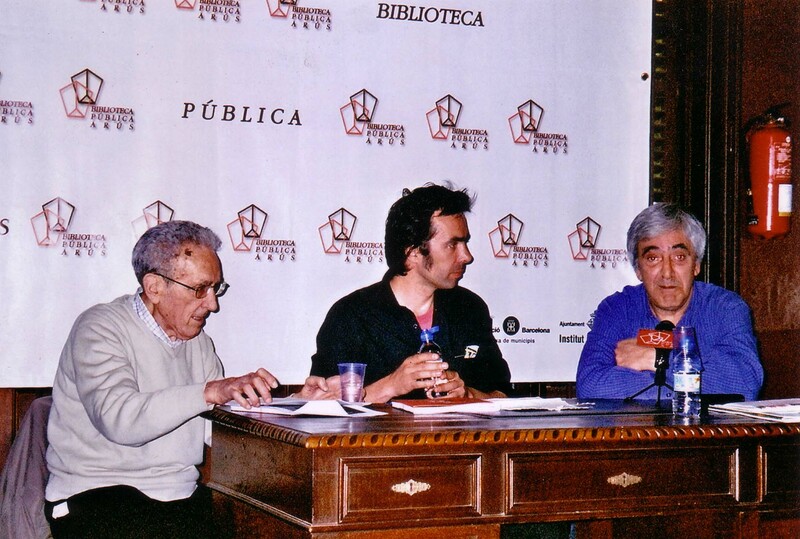 Eduardo Pons Prades Miguel Sarró “Mutis” i Manel Aisa, el 27 d’abril de 2006 el dia de la presentació del llibre de Mutis “Pinturas de guerra” a Barcelona.